In further keeping with my recent tradition of seemingly non-stop water enhancer reviews, I have—thanks to some samples sent over by the wonderful people at Kraft Foods—one of the newest additions to the water enhancer market to talk about today: Kraft's new Crystal Light Liquid. By this point, most people are familiar with Crystal Light. As one of the first low-calorie drink mixes to reach widespread popularity, Crystal Light has become somewhat of a household name, and with the recent rise to prominence of Kraft's MiO Liquid Water Enhancer, it was only a matter of time before the company's trademark powdered flavoring mix was converted into a handy liquid concentrate. As alluded to in the first sentence of the paragraph above, I have been reviewing a lot of water enhancers lately. These portable, "on-the-go" bottles of flavoring concentrate have become very popular over the past couple of years, and the industry is responding to this rise in popularity by releasing new enhancers en masse. It seems like every time I walk into the grocery store, there is a new water enhancer on the shelf with the rest of them. Some stores in my area have even had to install new, specialized shelving to make room for new brands and keep all of the tiny bottles organized. Custom, dispenser-style shelving at a local Bi-Lo grocery store. While I am always glad to see a new idea take hold so firmly in the beverage industry, the sudden proliferation of so many water enhancers into the marketplace has left me at a bit of a disadvantage in that it is becoming somewhat difficult to come up with adequately descriptive ways to differentiate between all of the different brands. Many of the water enhancers that are currently available are—if we are to be completely honest—fairly similar. Most of them use similar ingredients and sweeteners (most commonly a combination of sucralose and acesulfame potassium), have the same general serving size and number of servings per bottle, and offer flavor lines relatively similar to most of the competition. Crystal Light Liquid is no exception to these standards. The sweeteners and list of ingredients are almost identical to that of MiO, and the serving size remains constant at 24 servings per bottle. Where Crystal Light Liquid differentiates itself from the rest of the shelf, however, is its choice of flavors. The array of Crystal Light flavors is not only a good bit different from many of the flavor lines currently available on the market, but it is also varied in and of itself. At the time of this writing, each flavor in the line (Iced Tea, Pomtini, Peach Bellini, Strawberry Lemonade, Mango Passionfruit, and Blueberry Raspberry) is unique, and no one flavor element is repeated between the different varieties of Crystal Light Liquid. So far, I have tried the Mango Passionfruit and Blueberry Raspberry, and I have been satisfied with each. While I can't say that the two flavors that I have tried have been worlds apart from the taste of other water enhancers that I've had recently, I can say that I have enjoyed both of them quite well. The Mango Passionfruit flavor is appropriately sweet in a "fruity, but not sickeningly so" sort of way, and the Blueberry Raspberry has a fitting "berry" taste that cuts the sweetness with a hint of tartness. While they obviously don't taste particularly natural, the flavors are quite good, and the formulas seems especially well-balanced in comparison to some of the flavors offered by the competition. 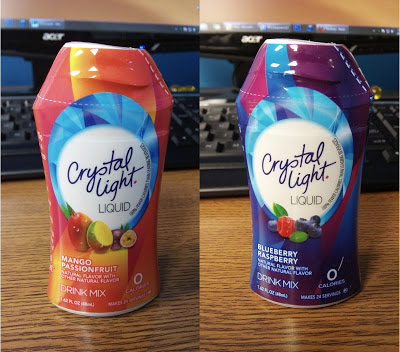 One thing that I noticed almost immediately upon sampling Crystal Light Liquid was that the flavor seems a bit lighter than it does in other brands. The artificial sweetener—while certainly still present—is not quite as noticeable in the flavor, and the artificiality of the drink as a whole is not as evident in the experience as it has been in previous efforts to perfect the portable water enhancer formula. From my experience so far, Crystal Light Liquid makes for a generally more pleasant drinking experience than many of the other water enhancers that I have tried. It is one of the first enhancers that I have ever used in two glasses of water in a row, and I don't find myself facing the "last ounce struggle" (having to either force myself to finish the last bit in the glass or pour it out due to an accumulation of artificial sweetener aftertaste lingering in my mouth) quite as often as I do with quite a few other enhancers. All in all, Crystal Light Liquid is a welcome addition to the exploding world of liquid water enhancers. If you are a fan of water enhancers and have yet to give this one a shot (or perhaps a squirt), be sure to pick up a bottle on your next trip to the store. You won't be sorry. Samples sent courtesy of Kraft Foods, Inc. I agree that the Crystal Light Liquid has a better drinking experence. Although Crystal Light Liquid and the Mio Liquid have basically the same ingredients I am unable to drink the Mio. It comes off with a very chemical taste to me. I have tried putting in different strengths to no avail. It will be Crystal Light for me. Drink freely the poison that is so readily available, Sheeple!